When the brackets were released two weeks ago one thing that caught the eye of many was that if the top seeds held, Cornell would have a rematch with Duke in the NCAA tournament, after falling 13-12 in last years Final 4. Not to mention, the rematch would take place on Cornell ’ s home field. Sure the quarterfinal locations are determined well beforehand, and the host team will have an advantage, but is it fair to do that t o a #1? Fair or not, it ’ s something thanks to the Ohio State 15-7 defeat of Cornell that we won ’ t have to debate. Ohio State is part of the surprising GWLL which placed three teams in the tournament, two of which are set to play in Ithaca on Sunday. Up until the last week of the season Ohio State ’ s only losses were in overtime. Many overlooked this club against the Ivy champs but as anyone who tuned in Saturday evening found out, their first trip to the tournament in five years was not satisfying enough. Ohio State likes to run, and while they did that all over Cornell, their opponent might be more up to the task on Sunday. NC's Note: Can Schroeder take it coast to coast again? Duke comes in the favorites to win their first national championship . There was a time that Greer and Danowski alone were able to fuel this team to greatness, but now the Blue Devils have weapons at every position and can play at both ends. Ohio State will need to have a great day at the face-off x, which may be difficult against Duke ’ s Sam Payton who won 61% of his draws this year. Stefan Schroeder will have to have the game of his career between the pipes for the Buckeyes. The only two losses this Duke team has had in the tournament came from outstanding goalie performances, both by Hopkins ’ Jesse Schwartzman, and still they were narrow one goal defeats. Ohio State ’ s game plan should be to mirror last years championship game performance, which means jumping out to a lead, it ’ s nearly impossible to play catch-up against Duke. 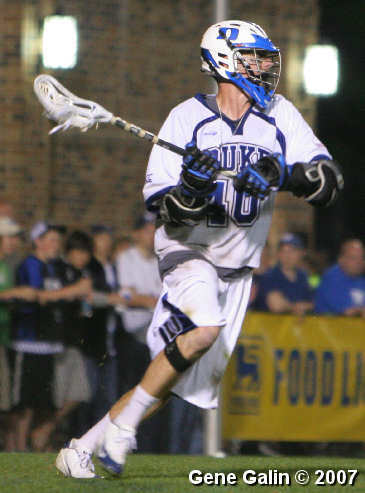 They need to dominate possession , which means winning face offs, and make Duke ’ s middies beat you. Ohio State has not shown the type of overall composure to play with Duke for the full 60 minutes. Then again, maybe they just have not had the opportunity. Many teams can hang around for a majority of the game, but Duke will make a run at some point and find separation . NC Note: Right on, Jay. It's not about preventing Duke from going on a run. It weathering out the inevitable run. Not much can be said about Duke ’ s plan, as long as they play their game and everyone takes care of the fundamentals and little things, look for Duke to be in Boston next weekend.